It was in 1922 when Jaguar founder William Lyons (later Sir William Lyons) set up his first business - the Swallow Sidecar Company, which was based in Blackpool and built motorcycle sidecars. In 1926 this business expanded into the Swallow Sidecar and Coach Building Company, which apart from the sidecars now also built coachwork for other car manufacturers. 1928 saw another change of name this time to the Swallow Coach Building Company, and production was moved to an ex artillery factory in Foleshill, Coventry. In 1931 William Lyons produced his own cars which were known as the SS1 and SSII, but in 1935 the first cars to be known as Jaguar were launched under the SS name. These cars were the 1½ litre SS Jaguar Saloon and the 2½ litre SS Jaguar Saloon. Also in 1935 two very desirable sports cars were produced - the SS90 and SS100. A 3½ litre SS Jaguar Saloon arrived in 1937. All car production ceased during the Second World War and the factory was turned over to aircraft and munitions work. In 1945 William Lyons wisely changed the company name from SS to Jaguar Cars, and production of the pre war models recommenced. 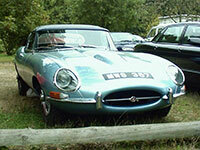 At the 1948 Earls Court Motor Show, Jaguar introduced its fastest car to date, the 3.4 litre XK 120 sports car. It had a top speed of 120 mph and was powered by an all-new twin overhead camshaft engine - an engine that was so good and ahead of its time, that this XK engine went on to power all subsequent Jaguar cars in one capacity or another for nearly forty years. In 1952 Jaguar moved to a new factory in Browns Lane Coventry, and 1954 saw the arrival of the even more powerful XK 140. It was during the 1950's that Jaguar had many great victories in motor sport as well as enjoying great success in building fast and luxurious saloon cars. In 1959 the famous Mk II saloon was introduced and quickly become the firm favourite of many. In 1960 Jaguar took over Daimler and in 1961, what is probably the most famous car in the world, the E type Jaguar was launched. In 1966 Jaguar merged with the British Motor Corporation and in 1968 a further merger with Leyland took place (although Jaguar was to regain its independence in the 1980's). Some say that things went a bit down downhill at that point but it was in 1968 that the world beating XJ6 was launched! Sir William Lyons retired as Managing Director and Chairman of Jaguar in 1972 and became the Honorary President until he died in 1985. After being in the ownership of the Ford Motor Company from 1990 to 2008 Jaguar is now owned by the Indian Tata Motor Company. The Jaguar 2.4 litre saloon was not only Jaguars first compact saloon car, but it was also their first car of unitary construction. It was introduced in September 1955. When the E Type Jaguar was launched in March 1961 at the Geneva Motor show it attracted the attention of the whole world like no other car ever had ever done before. The Mk II Jaguar was launched in October 1959 to replace the 2.4 & 3.4 litre saloons, which were immediately to become known as the Mk I. The Mk II was heavily based on its predecessor but had a much lighter and more modern appearance. Now often fondly remembered as the last of the "Battleship" Jaguars, the powerful and luxurious Mark IX saloon was launched in October 1958 to replace the Mark VIII. When the Jaguar Mk X was launched in October 1961, it was the very essence of Jaguars marketing slogan of the time - Grace, Space and Pace. The Jaguar XK 120 Roadster was launched at the 1948 Earls Court Motor Show and was an immediate success. This very stylish car had a top speed over 120 mph, hence the 120 name. The XK 140 Jaguar was introduced in October 1954 to replace the top selling XK 120. There were as before 3 body styles - Roadster, Fixed Head Coupe and Drophead Coupe. The Jaguar XK 150 was introduced in May 1957 in Fixed Head Coupe and Drophead Coupe form replacing the XK 140 range. The Roadster version came along in March 1958.